The first official photos of Kim Kardashian and Kanye West’s wedding at Forte di Belvedere in Florence, Italy, on May 24, have been released by E! News. 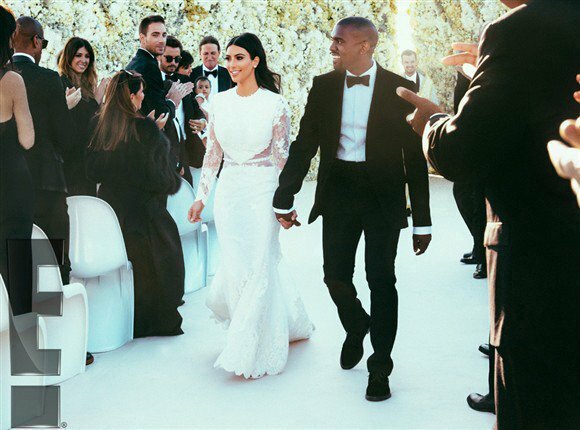 Kim Kardashian’s wedding dress was a white Givenchy Haute Couture gown. Kanye West kept it simple in a basic black Givenchy tux. After a costume change, Kim Kardashian, 33, later joined the reception in a short frock by Balmain. E!’s photos include one shot of the smiling Kim Kardashian and Kanye West holding hands as they exit the aisle following their exchange of vows. In another, they share a kiss before the massive wall of white flowers that provided a backdrop to the affair. The website also snagged a photo from Kim Kardashian’s final dress fitting with Riccardo Tisci that shows her appropriately over-the-top train flowing out behind her. After Kim Kardashian and Kanye West slipped rings on one another’s fingers, they enjoyed a musical homage to their union courtesy of John Legend, who performed All of Me. At the reception, the four-course meal and seven-layer wedding cake were accompanied by some 1,000 bottles of Ace of Spades rose champagne, according to ET.